That little something-something you just cannot resist! When it comes to attraction, dating and romantic relationships, we all have our own particular "type" we feel the strongest attraction toward. Sure, you might talk a good line about how YOU definitely do not have a type and how the heart wants what it wants but you remain open to falling in love with people who have all sorts of personality traits, personal styles and physical features, but such statements often don't line up with the truth of the choices we make. That's because we all have our own highly particular temptations when it comes to what leads us to fall in love. And while we while might tend to date people with certain external characteristics — like brown eyes or a rugged good looks — we still don't see ourselves as married to the idea of one specific "type" of person. However, many of us not only have a physical type we tend to fall for right on the spot, we also commonly have a "type" when it comes to personality and temperament. And, of course, the personality traits we're most magnetically attracted to aren't always ones we're proud of feeling drawn to, let alone this being information about ourselves we'd want to go screaming from any rooftops. Love is, after all, a deeply personal thing, so it makes sense that we wouldn't want to share the intimate knowledge of what makes our heart go pitter-pat with any old stranger on the street! However, if you're curious to know more about the personality traits that secretly attract you most in love and relationships, you're in the right place. Whether you're conscious of it or not, there are specific traits that get your motor running, and this little quiz is designed to help you quickly establish what those traits might be so you can start ACTUALLY looking for them! 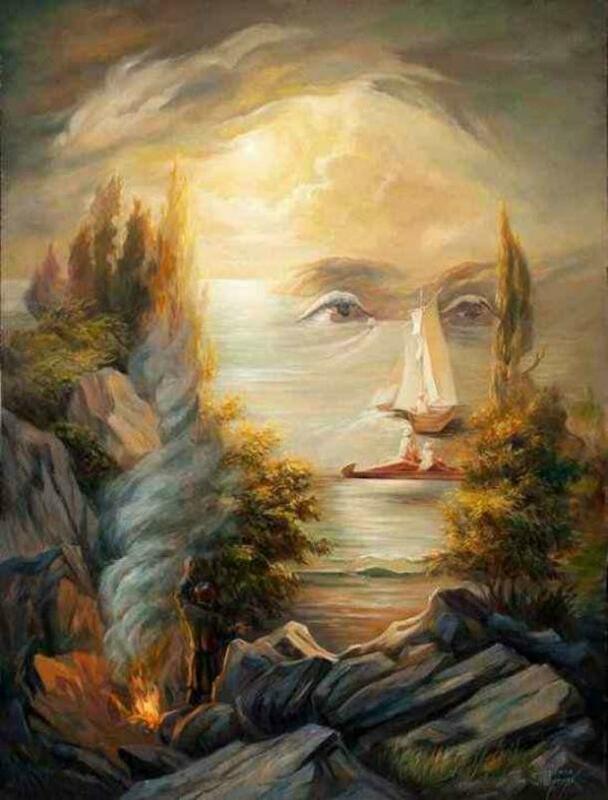 Simply look at the picture below and make a mental note of the first thing that catches your eye. Then, scroll down to find out what this optical illusions-based quiz reveals the dominant personality traits that secretly tempt you most when it comes to falling in love! If you saw the man's face first when you looked at the image, the personality trait that secretly tempts you most in love is shyness. You just can't help yourself! You aren't shy yourself, in fact, you're something of a loud-mouth, but that doesn't mean you don't find someone else's shyness endearing. Sure, still waters can run deep, but be wary of trying to convince someone who has little to say — and even less on their mind — that they just need to be pulled out of their shell. You can't, and you shouldn't try to change anyone. If you saw the fire first when you looked at the image, the personality trait that secretly tempts you most in love is a hot-temper! You're not looking to get into an abusive relationship, of course. You've got your head set firmly on your shoulders. But there's something you've always found alluring about being with a lover who is passionate in every single way, and that includes losing their temper with a bang. There are healthy ways to be angry and not so healthy ways to be angry. If you suspect that your partner's anger is unhealthy, it's time for a conversation — perhaps with a therapist. If you saw the people in the boat first when you looked at the image, the personality trait that secretly tempts you most in love is extroversion. You aren't an extrovert in the least. You love — and heck, you even need! — time to yourself in order to feel well-rested, happy, and recharged. But you respect a person who isn't just life the of the party, but a person who IS the party! As long as the two of you can respect each other's needs when it comes to social time versus alone time, there's no reason you can't find your own happily ever after together! If you saw the distant beach huts first when you looked at the image, the personality trait that secretly tempts you most in love is an inability to express emotion. Maybe you are hyper open with your feelings, or maybe you have done the heavy lifting required to deal with your feelings appropriately, but whatever it may be you can't help but feel pulled toward a person who is locked down harder than Alcatraz. While it might seem seductive and sexily aloof, not being able to open up isn't great, and neither is being constantly open with your feelings. Try your best to find a happy medium together and will be well.